Sample temperature during low-temperature crystallization using soft X-ray source was investigated. The temperature of silicon film on glass substrate was measured by a thermocouple or pyrometer and was calculated using computational fluid dynamics. When the heat transfer coefficient without thermal contact resistance between sample and sample holder was used for the calculation, the calculated temperature was lower than the measured temperature. It is considered that thermal contact resistance is important for thermal calculation during the soft X-ray irradiation. However, the calculated temperature distribution (the area of high-temperature region) in plain agreed with the crystallized area. It is expected that the sample temperature during the soft X-ray irradiation can be calculated by using effective heat transfer coefficient included thermal contact resistance. The computational fluid dynamics is useful for application of soft X-ray irradiation technique to industry. The low-temperature crystallization of amorphous silicon (a-Si) and amorphous germanium (a-Ge) is important for the realization of high-quality flexible displays and solar cells. Therefore, the low-temperature crystallization methods, including excimer-laser annealing (ELA) [1-3], rapid thermal annealing (RTA) [4,5], plasma-jet annealing (PJA) [6,7] and metal-induced lateral crystallization , have been widely investigated. To suppress the damage to the glass substrate, most of these methods use liquid crystallization processes that have short durations from sub-microseconds [9,10] to several tens of milliseconds . In addition, the explosive crystallization  of amorphous semiconductors was studied for laser irradiation  and flash lamp annealing . We try to develop the low-temperature crystallization method that uses soft X-ray irradiation [15-19] from the synchrotron orbital radiation facility NewSUBARU . To discuss the crystallization mechanism and useful of this crystallization method, we have to prospect each temperature of Si film and glass substrate, and the temperature distribution at various irradiation conditions. The sample temperature profile is important for crystallization. The sample temperature during the crystallization has been reported for ELA , RTA  and PJA . 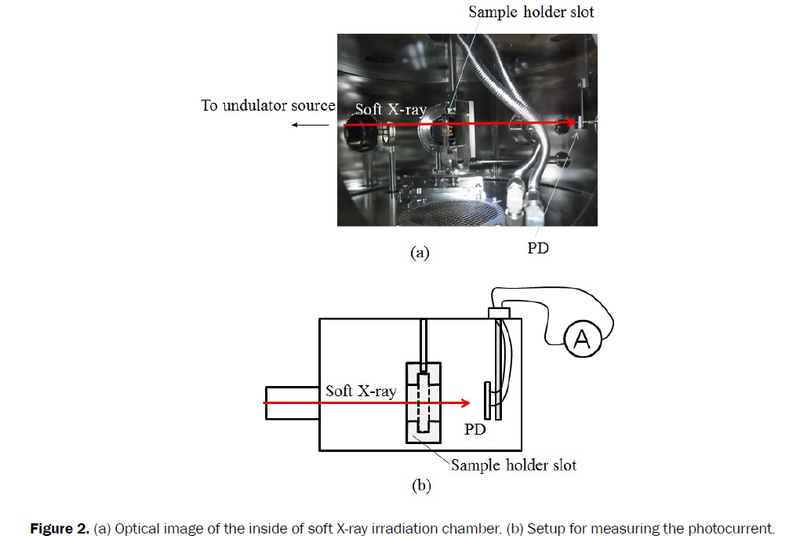 However, the sample temperature and temperature distribution during the soft X-ray irradiation have not been calculated. In this paper, we calculated the temperature distribution of Si film/glass substrate during the soft X-ray irradiation using computational fluid dynamics. The calculated temperature distribution was compared with the measured temperature distribution. The soft X-ray irradiation was carried out at the BL07A in NewSUBARU. The soft X-ray irradiation apparatus is shown in Figure 1. The light source of BL07A was a 2.28 m undulator. The undulator light was introduced to the sample stage via a cylindrical mirror. Photon flux density was measured from a photocurrent of a Si photodiode (PD) using quantum efficiency of the photo diode. 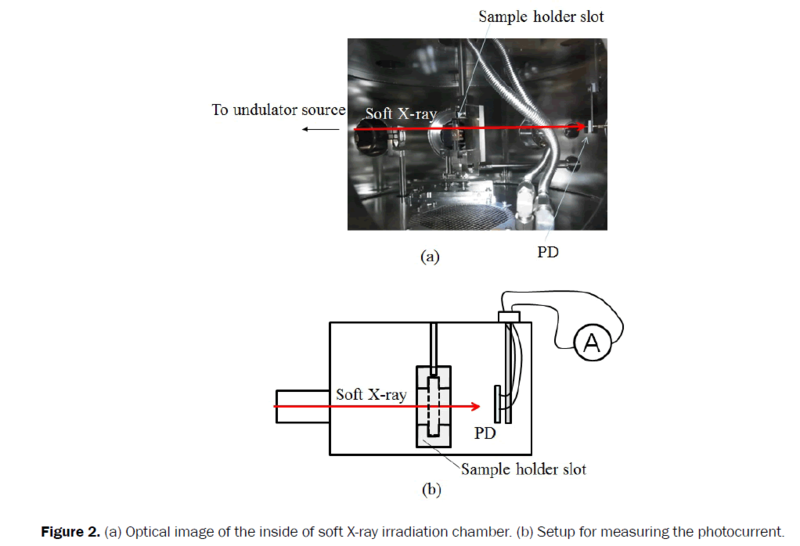 Optical image of the inside of the soft X-ray irradiation chamber and the setup for measuring the photocurrent are shown in Figure 2. The photocurrent was measured without sample at the storage-ring current of 2.2 mA because the measuring limit of photocurrent exceeded above the storage ring current of 10 mA. It is known that the photon-flux density is proportional to the storage-ring current. Therefore, the photocurrents at various storage-ring currents were estimated proportionally using the value of the photocurrent at 2.2 mA. Figure 1: Schematic diagram of soft X-ray irradiation. Setup for measuring the sample temperature using a TC and a pyrometer was also shown. The soft X-ray generated at the undulator source irradiated with the sample surface via M0 mirror. Figure 2: (a) Optical image of the inside of soft X-ray irradiation chamber. (b) Setup for measuring the photocurrent. The sample temperature was measured using a thermocouple (TC) and a pyrometer, as shown in Figure 1. The temperature distribution of the a-Si/glass substrate was measured by moving the sample. In this case, a K-type TC was attached on the surface of the a-Si/glass substrate with a size of 10 × 10 mm2, via a ceramic bond. The light spectrum was calculated using SRW . In the calculation, the storage-ring energy, storage-ring current, undulator gap were 0.987 GeV, 100 mA, and 46.7 mm, respectively. In addition, the reflectivity of soft X-ray on M0 mirror was also calculated in the range of 0 and 1000 eV by SRW. The M0 mirror consisted of Pt (56 nm)/Cr (5 nm)/Si substrate. The surface roughness of each layer was assumed to be 0.1 nm. The irradiated photon number on the sample surface was estimated theoretically by product of the photon flux at the generated point and the reflectivity on the M0 mirror. ANSYS 14.5 was used for the sample-temperature calculation. The sample was a-Si film on glass substrate in thickness of 0.5 mm. The thickness of a-Si film was 50 nm. The sample size was 20 × 20 mm2. The size of sample holder made of stainless steel (SUS304) was 80 × 35 × 10 mm t. In this experiment, the sample was fixed on the sample holder using two metal plates, and the sample holder attached to the sample was set to a slot in vacuum chamber, as shown in Figure 2. To simplify the calculation, the effect of the metal plates was incorporated by the thermal conductivity between the sample and the sample holder. In addition, the thermal conduction from the sample holder to the slot was negligible because the contact area was as small as 270 mm2. The parameters and its values for temperature calculation are summarized in Table 1. The value of heat flux measured by PD was used for calculation. Table 1. Parameters and values for temperature calculation. The a-Si film was deposited on a glass substrate via plasma-enhanced chemical vapor deposition at 673 K, using Si2H6 source gas. The a-Si film thickness was 50 nm, measured using a contact profile meter. The deposition rate and the hydrogen content in the as-deposited a-Si film were 0.2 nm s-1 and 10 at.%, respectively. The a-Si films were dehydrogenated at 723 K using thermal annealing, and the hydrogen content in the a-Si was below 1 at.%. The hydrogen content was estimated using Fourier transform infrared measurements . The electron energy of the NewSUBARU ring was 0.987 GeV during this experiment. The photon energy incident on the sample was controlled by changing the gap in the undulator. The photon energy was 115 eV. The wavelength of X-ray was 10.8 nm. The ambient pressure during irradiation was 5 × 10-5 Pa. The X-ray beam size was 7.5 × 7.5 mm2, measured using a fluorescent plate on the sample holder. The changes in the structural properties of the film were measured using Raman scattering spectroscopy. The Raman spectroscopy was carried out at room temperature using the 514.5 nm line from an Ar-ion laser. The measurement region for the Raman spectroscopy was a few μm in diameter in the plane, and a few μm in depth. Raman spectra were obtained in the center of the irradiation region and the non-irradiation region. The horizontal axis (wave number) in the Raman spectrum was corrected using the 521 cm-1 peak position for a single-crystal Si substrate, measured before and after the sample measurements. The ratio of the crystalline and amorphous phases was evaluated using the transverse optical phonon signal of the Raman spectra. For the Si film, the crystalline fraction was estimated using the ratio of the signal from the crystalline phase at approximately 521 cm-1 to the sum of the signals from both the crystalline and amorphous phases at approximately 480 cm-1 . The photocurrent as a function of undulaor gap is shown in Figure 3. The photocurrent increased with decreasing the undulator gap. When the undulator gap increased, the photon energy of X-ray generated from undulator source increased. In the case of storage-ring current of 220 mA, the fluence was estimated to 11 J/mm2 under conditions of 46.7 mm (on the other word, at photon energy of 115 eV). Figure 3: Photocurrent as a function of undulaor gap. The photocurrent was measured using the PD at the storage-ring current of 2.2 mA. The undulator gap at 115 eV was shown as an arrow. In this experiment, a monocrometer was not used. Therefore, many higher-order light was included in the irradiated soft X-ray. The calculated photon flux at gap of 46.7 mm and the storage-ring current of 220 mA is shown in Figure 4a. This pattern of photon flux intensity is decided by polarization constant, K parameter. In this apparatus, the photon below 50 eV was cut by a filter. The 3rd order light of 115 eV is mainly generated under condition of 46.7 mm. However, other X-rays with high-photon flux are generated at 192 eV (5th) and 268 eV (7th). In addition, the reflection mirror (M0 mirror) with Pt (56 nm)/Cr (5 nm)/Si substrate structure was used to switch the beam line and the reflectivity of M0 mirror have the photon energy dependence as shown in Figure 4b. Therefore, the photon-flux dependence of photon energy on sample surface was calculated by product of photon flux generated from the unduator source (Figure 4a) by the reflectivity of the M0 mirror. The calculated photon flux on the sample surface is shown in Figure 4c. Although the photon flux was low above 500 eV, in order to estimate the actual sample temperature, the photon flux should be considered not only single photon energy (115 eV) but also each photon energy. Figure 4: (a) Calculated photon flux at the undulator gap of 46.7 mm and the storage-ring current of 220 mA. (b) Reflectivity of M0 mirror with Pt (56 nm)/Cr (5 nm)/Si substrate. The cross-sectional structure of M0 mirror is illustrated in insert. (c) Photon-flux dependence of photon energy on the sample surface was calculated by product of photon flux generated from the unduator source by the reflectivity of the M0 mirror. The temperature distribution of the a-Si film/glass substrate is shown in Figure 5. 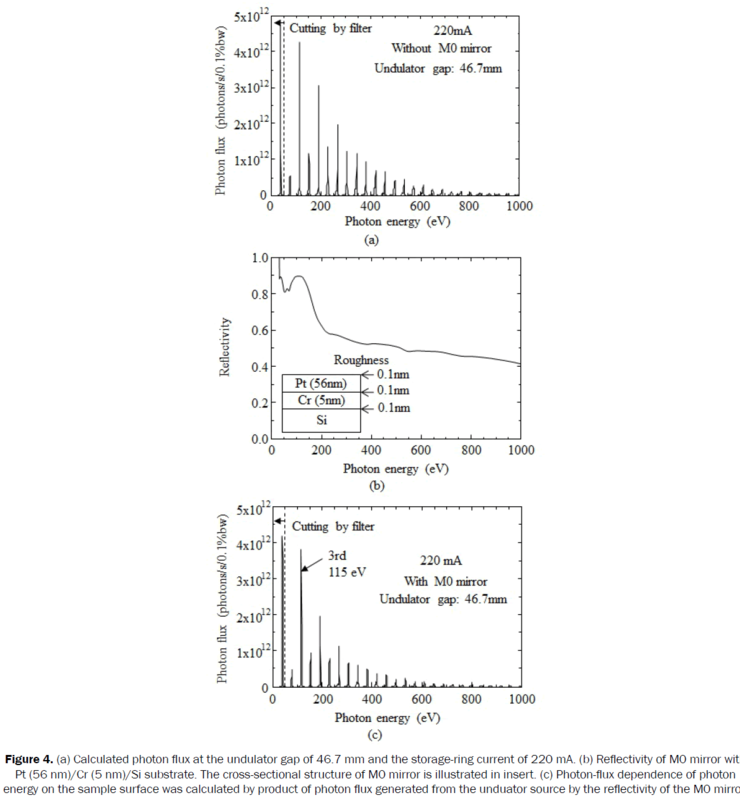 The temperature distribution was measured using a TC during soft X-ray irradiation for a storage-electron energy of 0.987 GeV, storage-ring current of 220 mA, radiation dose of 50 mA h, and the undulator gap of 46.7 mm (photon energy of 115 eV). The maximum and minimum temperatures were 953 and 613 K, respectively. The difference in temperature was large, in spite of the small sample sizes, because the area of high photon-flux density was small and the thermal conductivity of the glass substrate was low (7 × 10-4 W m-1 K-1). Figure 5: The measured temperature distribution on the a-Si film/glass substrate. The storage-ring current and undulator gap were 220 mA and 46.7 mm (photon energy of 115 eV). The measurement points were 9 points by each 4 mm length. The calculated sample temperature is shown in Figure 6. The maximum sample temperature was 299.8 K and this temperature was very low compared with the actual temperature measured by TC (953 K). It is considered that the thermal flow from the sample to the sample holder was dominant. Unfortunately, the thermal contact resistance was not considered in this calculation. When the thermal contact resistance was large, the calculated temperature will be increased. It is shown that the heat transfer coefficient between the sample and the sample holder is important for controlling the maximum sample temperature and the temperature distribution. In addition, the sample temperature during the soft X-ray irradiation can be calculated using effective heat transfer coefficient included the thermal contact resistance by computational fluid dynamics. Figure 6: The calculated temperature distribution. (a) Calculation model. (b) Temperature distribution of a-Si/glass substrate during the soft X-ray irradiation. An optical image of the soft-X-ray-irradiated a-Si film is shown in Figure 7a. The diameter of the color-changed region was 7.5 mm. Figure 7b shows Raman spectra for the Si film, taken at various points. The a-Si was crystallized at positions a and b; a peak due to the crystal phase was found at a Raman shift of 521 cm-1. The peak due to the amorphous phase was observed only at position c, which was not discolored. We confirmed that the color-changed region was the crystallized region. The temperature at the edge of the color-changed region was estimated to be approximately 790 K from Figure 5. The color-changed region coincided with a region in which the temperature was slightly lower than the crystallization temperature. We believe that the color-changed region was correlated with the high-photon-flux region (high-temperature region). The crystalline fractions of the center (position a) and edge (position b) of the color-changed region were almost the same (75 %), but the peak temperatures experienced by the regions differed by 160 K.
Figure 7: (a) Optical image of the soft-X-ray-irradiated a-Si film/glass substrate. (b) Raman spectra measured at positions a, b, and c.
In order to apply the low-temperature crystallization using soft X-ray source in industry, the temperature of Si film on glass substrate was calculated using computational fluid dynamics. Under the common condition, the calculated sample temperature was 299.6 K and this temperature was very low compared with the measured temperature by TC (953 K). It is considered that thermal contact resistance is important for thermal calculation during the soft X-ray irradiation. However, the temperature distribution agreed with the crystallized region. 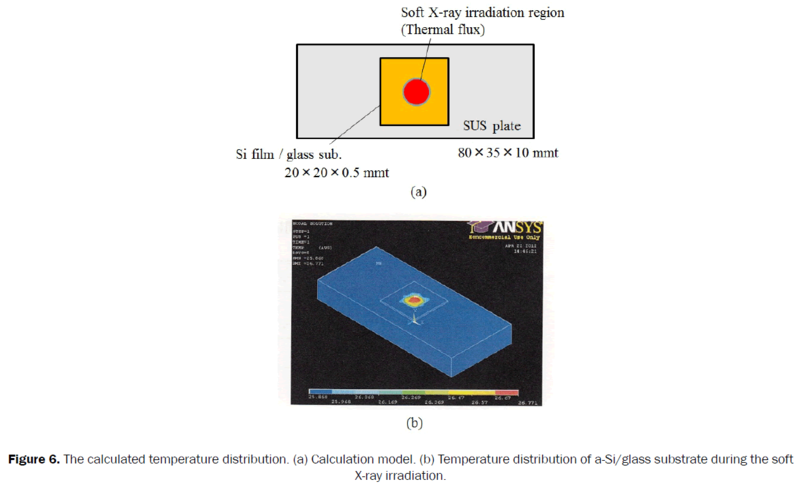 It is expected that the sample temperature during soft X-ray irradiation can be calculated using effective heat transfer coefficient included thermal contact resistance by computational fluid dynamics. The computational fluid dynamics is useful for application of soft X-ray irradiation technique to industry. The authors would like to acknowledge to Professor K. Kanda of LASTI, University of Hyogo for suggestion of soft X-ray irradiation. Sameshima T, et al. XeCl excimer laser annealing used to fabricate poly-Si TFT’s. Jpn J Appl Phys 1989;28:1789-1793. Matsuo N, et al. Study of crystal growth mechanism for poly-Si film prepared by excimer laser annealing. Jpn J Appl Phys 2000;39:351-356. Watakabe H, et al. Electrical properties for poly-Ge films fabricated by pulsed laser annealing. Thin Solid Films 2006;508:315-317. Chenq HC, et al. Thin-film transistors with polycrystalline silicon films prepared by two-step rapid thermal annealing. Jpn J Appl Phys 2000;39:L19-L21. Yudasaka I and Ohshima H. Rapid thermal annealing technique for polycrystalline silicon thin-film transistors. Jpn J Appl Phys 1994;33:1256-1260. Higashi S, et al. Application of plasma jet crystallization technique to fabrication of thin-film transistor. Jpn J Appl Phys 2005;44:L108-110. Yorimoto T, et al. Formation of low-defect-concentration polycrystalline silicon films by thermal plasma jet crystallization technique. Jpn J Appl Phys 2008;47:6949-6952. Ihn TH, et al. Electrical stress effect on poly-Si thin film transistors fabricated by metal induced lateral crystallization. Jpn J Appl Phys 1997;36:5029-5032. Hatano M, et al. Excimer laser-induced temperature field in melting and resolidification of silicon thin films. J Appl Phys 2000;87:36-43. Taheri ML, et al. In situ laser crystallization of amorphous silicon: Controlled nanosecond studies in the dynamic transmission electron microscope. Appl Phys Lett 2010;97:032102. Furukawa H, et al. Millisecond rapid thermal annealing of Si wafer induced by high-power-density thermal plasma jet irradiation and its application to ultrashallow junction formation. Jpn J Appl Phys 2009;48:04C011. Donovan EP, et al. Calorimetric studies of crystallization and relaxation of amorphous Si and Ge prepared by ion implantation. J Appl Phys 1985;57:1795-1804. Geiler HD, et al. Explosive crystallization in silicon. J Appl Phys 1986;59:3091-3099. Ohdaira K, et al. Explosive crystallization of amorphous silicon films by flash lamp annealing. J Appl Phys 2009;106:044907. Matsuo N, Mochizuki T, Miyamoto S, Kanda K, Tanaka N, Kawamoto N. Crystallization by soft X-ray irradiation. Digest of Active-Matrix Liquid-Crystal Displays; July 2005; Japan. Matsuo N, et al. Influence of laser plasma soft X-rayirradiation on crystallization of a-Si film by infrared furnace annealing. Mater Trans 2010;51:1490-1493. Heya A, et al. Low-temperature crystallization of amorphous silicon and amorphous germanium by soft X-ray irradiation. Thin Solid Films 2013;534:334-340. Heya A, et al. Crystallization of Si1-xGex multilayer by soft X-ray irradiation. Appl Phys Express 2013;6:06501. Heya A, et al. 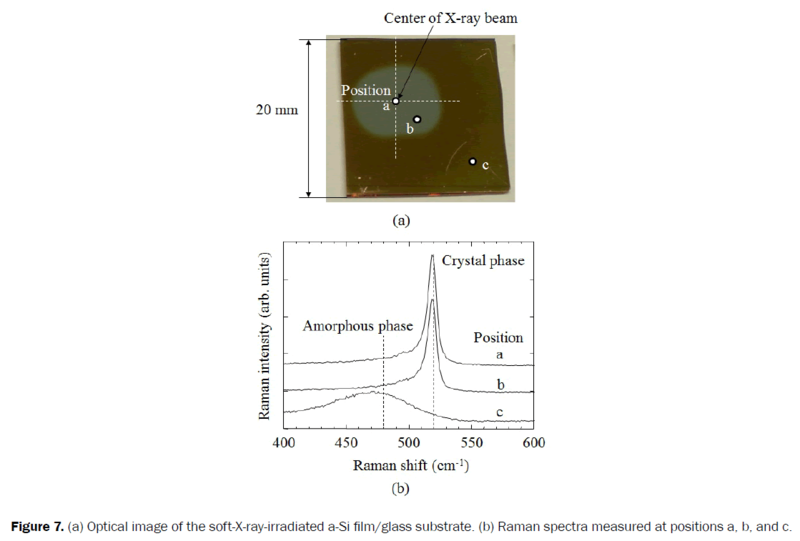 Photon energy dependence of crystallization of Si1-xGex films by soft X-ray irradiation. Jpn J Appl Phys 2014;53:115504. Ando A, et al. Isochronous storage ring of the New SUBARU project. J Synchrotron Rad 1998;5:342-344. Third CE, et al. Mathematical model of internal temperature profile of GaAs during rapid thermal annealing. Jpn J Appl Phys 1991;69:8037-8041. Okada T, et al. Analysis of transient temperature profile during thermal plasma jet annealing of Si films on quartz substrate. Jpn J Appl Phys 2006;45:4355-4357. Langford AA, et al. Infrared absorption strength and hydrogen content of hydrogenated amorphous silicon. Phys Rev B 1992;45:13367-13377. Kitazima I and Iwasawa H. Stimulated Raman scattering from silicon. Jpn J Appl Phys 1972;11:599.